There are four conditions that optimize the growth of tropical bamboos: Sunlight, regular irrigation, good drainage, and at least occasional fertilization. If any of these conditions is lacking, the growth rate will be affected in direct proportion to the deficiency. You can certainly have a beautiful bamboo, but again, the growth rate will not be maximized. Most tropical bamboos grow quicker and do their best in full sun. As long as at least four hours of sun reaches the leaves, your tropical bamboo will be happy. If grown in broken light or partial sun, the number of shoots per year will not be as high as if it were in full sun. Some tropical bamboo species will stretch - elongating its internodes - if grown under the canopy of another tree in an effort to reach the sun. These bamboos have culms that have been measured much longer than their standard ABS listing. When you first plant your bamboo you will need to make sure that it has enough water every day for at least a month or so. This means you may have to hose soak it if you irrigation system only hits the area every other day or less often. Even if your irrigation system covers the area daily, watch the leaves of your new bamboo. If they start to curl, the bamboo needs more water. This is easily the number one problem reported by new growers. I certainly don’t want you to keep your bamboo in standing water but please make sure it gets off to a good start with a bit of early watering diligence. Tropical Bamboo Nursery now is offering our own Bamboo Fertilizer in 2 lb. jars. This is a timed-release mix that we use in containers as well as for field specimens. New bamboos can be fertilized with a balanced lawn or, especially, palm fertilizer. After the first year, higher nitrogen formulas can be used. Iron supplements are beneficial. If your soil is somewhat alkaline (as in South Florida), there are many sulphur/iron mixes (granular or liquid) that work well and show favorable results quickly. Don’t use a weed-n-feed lawn fertilizer. Compost and mulch are the easiest way to maintain healthy soil and bamboos. If your mulch is fresh and uncomposted, fertilize before mulching. The microorganisms that break down the mulch will rob the nitrogen from the soil so you’ll have to feed them as well as the bamboo. After the second year you can remove some of the original growth. Do not take more than 1/3 of the culms. Cut out only the old culms (usually the smallest in the clump). Cut them near the base, just above a node. If a culm is tan, it’s dead and should be removed. I use a small handsaw or sometimes a reciprocating saw. You can thin the clump each year. Avoid removing the newest culms unless they are growing awkwardly or into an unwelcome area. You can also remove branches to reveal the canes or to create a more open effect. I do this with all of my low-branching species as a personal preference. If you’re planting several bamboos to create a screen, hedge, or windbreak, the spacing will vary depending on the species, density required, and the speed required for establishment. Tropical bamboos can be planted as close as 3 feet on center but 5 feet on centers is the average spacing. 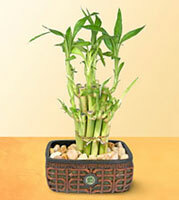 The popular "lucky bamboo" plant is technically "dracaena sanderia," - a lily, not an actual bamboo plant. It is a houseplant that is most often rooted in water and supported by pebbles. We only grow tropical bamboos and can only offer expert advice on our specialty. Real tropical bamboos cannot survive if planted in water, or even with constant wet feet. Ours are landscape ornamentals that grow relatively large, depending on the species, and are happiest if planted outdoors. Tropical bamboos are less susceptible to pests or diseases than most other tropical plants. However, there are a couple of pests, a fungus, and a virus that, in the U.S., may be introduced to you in conversation or you may suspect on your tropical bamboo plant. Most are not fatal and usually don't greatly affect the growth of the bamboo. We, and our local Plant Industry inspectors, monitor our stock to ensure that no problems originate at our nursery. Fungal spots - On older culms, especially in humid conditions, fungal spots can appear - usually in a circular ring pattern. The effect is mostly cosmetic. This can be treated topically with a copper-based product that's labeled for plant fungus problems. Alternatively, since the affected culms are usually old, the culm(s) can be simply removed from the clump. BaMV (Bamboo Mosaic Potex Virus) - This is a virus that is transmitted only by physical vectors (usually cutting tools). It is actually difficult to transmit but people do manage to spread it - especially in places where bamboo is grown in plantations for edible shoots. Reputable ornamental growers do not freely distribute infected plants so, hopefully, you will not encounter this disease. The effects can range from a mosaic pattern in the leaves to complete death of the bamboo. There is one species (D.latiflorus Mei Nung) that is a carrier of the virus but shows little to no symptoms. If you have this species and insist on growing it , it is certainly infected, so take precaution to sterilize all tools that come in contact. There are other species that known to be infected in some areas. These species include: D.latiflorus, B.oldhamii, B.edulis, B.beecheyana, and B.dolichloclada. There is no cure for the virus but all of the plants at Tropical Bamboo Nursery have been lab tested. Infected bamboo varieties are not sold without an educational (verbal) discussion with they buyer. Black Sooty Mold - this is probably the most common reported issue reported on tropical bamboos. In South Florida, the B.multiplex varieties are most susceptible. Any bamboo species with dense branch compliments at the nodes are good candidates. The problem is caused by aphids that secrete a sticky honey-like substance that accumulates mostly in the branch bases. The sooty mold grows on this secretion. Ants favor the secretion and will farm the aphids, moving them around to other parts of the bamboo. Treat with garden center products labeled for control ants and/or aphids. You can also use a pressure washer to blast off the mold. Scale - This is often ignored by growers as it can be difficult to notice. It can, however, become so dense that it can completely cover culms in a clump, changing the color to brownish/gray. Regardless, the bamboo never seems to notice their presence so treatment is often a matter of personal preference. Scale affects many of the Bambusa species as the culm are glabrous. Some of the Dendrocalamus, like giganteus, are also favorites. Scale are tiny sucking insects with waxy-coverings on their backs. They must be either removed physically or treated systemically. Contact insecticides are ineffective because of the waxy shield. If systemic insecticides (insecticides that are absorbed into the plant tissue and consumed by the sucking insect) are used, the dead bugs will remain attached to the culm, branch, or leaf. It's easy to blast them off the culms, dead or alive, with a pressure washer. Use garden center systemic products labeled for scale. Insecticidal oils and soaps may be effective but must be applied at more frequent intervals. 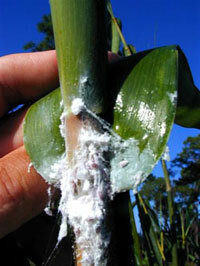 Bamboo Mealybug (Palmicultor lumpurensis) - This is a bamboo-specific mealybug so it should not affect other plants. It was first officially reported in 2002 in Central Florida hhttp://www.freshfromflorida.com/content/download/9805/135098/palmicultor-lumpurensis.pdf. The mealybugs are multi-stage insects and are easily identified when they are surrounded by sticky white webbing - almost always on new shoot tips (culm tips or branches). If you see unusual white substance on shoot tips, peel back the culm leaves and you should see small pink bodies in the webbing or on the culm. Sometimes natural white powdery bloom on the new shoot can appear to be the webbing but is a false alarm. Make sure you look for the bugs before making an assumption of infestation. Usually the bamboo shoots develop with no adverse affects. Occasionally, the infestation is so severe that the culm, or culms, abort. Mealybugs won't kill a clump of bamboo but they can get ugly and possibly cause shoots to abort. The mealybug destroyer(Crypt) Beneficial predatory insects can be effective at least short-term. The mealybug destroyer (Crypts) especially loves these mealybugs and will quickly eat any active colonies. Crypts can be ordered from many online sources. The problem is that mealy bugs are multi-stage and the Crypts only stay around as long as there is live food (not eggs). As soon as the Crypts leave, new mealys hatch and you may have to buy more Crypts. In November/2006, I spoke by telephone with Dr. Greg Hodges (see link above on first report) and asked him if there was anything new since his report. He told me that in 2004 the original infestation at the Lake Buena Vista, FL location was severe and that, strangely, without chemical treatment, the condition seemed improved in 2005. By 2006, there were only minimal signs of mealybug but close inspection revealed colonies of ladybeetles (Cryptolaemus montrouzieri - Crypts or Mealybug Destroyers). I don't know yet if the Crypts were manually introduced or just naturally appeared but the situation appears to have been balanced at this location. Dr. Hodges also said that, when he first wrote his report, he could find very little published reference data worldwide on this bamboo mealybug. He thought that might have meant Palmicultor lumpurensis was not considered to be much of a threat in the countries where it has been established. "Systemic and contact insecticides are effective and there are several available at garden centers labeled for mealybugs. A detergent (Ivory dish soap is great) should be added as a surfactant if you foliar spray with a contact insecticide as the webbing is difficult to penetrate with a water-based solution. The key is to thoroughly spray your bamboo - all sides, top to bottom. Don't miss any part of the bamboo and spray out to the drip line on the ground. Then re-apply every 10-14 days for at least three cycles. Do this even if you don't see any new mealys that have hatched. You have to break the cycle. If you spray once or twice and think you've eliminated the problem, new bugs will appear in a few weeks to taunt you." The most-effective treatment to date for homeowners is one of the Bayer Advenced Tree & Shrub products. These are available at most garden centers and home improvement stores. They are applied simply by drenching the root zone or by spreading slow-release granules around the root zone. If you can't find these specific products, look for a similar product that contains the active ingredient imidacloprid which is a synthetic form of nicotine. 1) (Dinotefuran) Safari together with Joint Venture surfactant (or Ivory dish detergent) in the spray tank. The Safari is mixed with 50 gallons of water at 5 oz. total. I mix in 8 oz. of Joint Venture. I also mix in Tracite 20-20-20 water-soluble fertilizer to provide some nutritional benefit for the bamboos. Soak the infested bamboo top to bottom - especially the shoots and branch shoots. Make sure the inner culms are covered as well. You have to re-apply after 14 days to make sure any new hatchlings are zapped. 2) (Acetamiprid) TriStar - This is a neonicotinoid like Merit or Marathon (Imidicloprid). Any of these products will work for this rotation. Two TriStar 70 WSP water-soluble packets per 50 gallons. Joint Venture surfactant 8 oz. Per 50 gallons (or Ivory dish detergent) and Tracite 20-20-20 water-soluble fertilizer is mixed in. NOTE: For homeowners, TriStar 30 sg is available and mixed at 3 oz. per 50 gallons. Bayer Advanced Tree & Shrub (Merit) is available in Home Depot. Both of these are diluted versions of the professional formulas but, for one or two bamboos, they should be effective. 3) (Buprofezin) Talus, which interrupts the larval stage of the growth cycle. This comes in bags containing 24 water-soluble pouches. One pouch per 10 gallons. Dimethoate (Cygon) can be mixed in at 16 oz. per 50 gallons. Joint Venture surfactant 8 oz. Per 50 gallons (or Ivory dish detergent). No fertilizer is added to the tank with Talus because it is labeled to not be mixed with boron, chromium, or other micronutrients. The Safari treatment seems most powerful immediately with contact and systemic controls but it is important to rotate insecticides. I haven't used Orthene (acephate) but reports indicate that it is also an effective control. A .773# can of Orthene makes 150 gallons. Obviously, take measures to prevent getting any of this stuff on your skin or in your lungs.